Last year I reported on the ‘terroir wines‘ from the Châteauneuf-du-Pape producer, Ogier. When Ogier invited me to visit them in the Rhône Valley recently to see the vineyards that produce these wines and taste the latest vintages, I readily accepted. Though founded as a wine company in 1859, Ogier operated as a négociant, buying grapes and wines from local growers and winemakers to mature and bottle under their own label. It was not until the company was purchased by the JeanJean group in the 1990s, and particularly when they purchased the Clos de l’Oratoire des Papes vineyard in 2000, that domaine-bottling of high-end Châteauneuf became part of the business. In 2010, JeanJean merged with the Michel Laroche company to create a new business called ‘AdVini’ which comprises a ‘family’ of wine brands and estates that criss-crosses France. 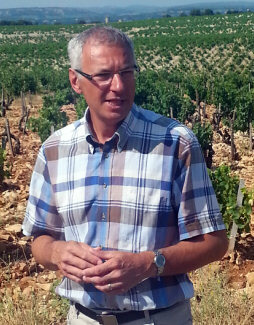 Ogier, headed by President Jean-Pierre Durand with the wine made by Didier Couturier (right) is one of their most famous houses, but the portfolio also includes Laroche in Chablis, Cazes in the Roussillon and Rigal in Cahors amongst others. Based in the town of Châteauneuf-du-Pape, Ogier produces its Clos de l’Oratoire Châteauneuf-du-Pape in white and red versions, as well as a ‘super cuvée’ called ‘Les Chorégies du Clos de l’Oratoire’. Whilst I tasted those plus various other Rhône and southern Mediterranean wines within the Ogier portfolio, it was the series of four ‘terroir’ wines that was the focus of this visit. Launched only in 2011, the wines form part of a fascinating project to express the four different soils and terroirs of Ogier’s Châteauneuf-du-Pape vineyards. The wines are are sold as mixed pack of four, and are made identically: picked at the same time, made from a blend of the same grapes, and made with exactly the same winemaking techniques, barrels, etc. In theory, these wines should express their terroir quite clearly, as nothing but the soil in which they were grown is different between the cuvées. The photos above show two of Ogier’s vineyards, with obvious differences between the Eclats Calcaires (top) and Galets Roulés (bottom) soils. Click photos for bigger versions. 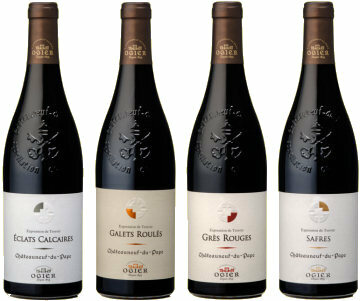 The four terroirs that Ogier bottle in the series are: Galets Roulés – rolled pebbles carried into the vineyards by glaciers with a rounded, polished character. The roots of the vines can go up to five metres deep, and the pebbles absorb heat which is released at night. Safres – a soil composed of compressed fine sand. It has evolved from marine sediment, with no stony pebbles and low in limestone. It is said to be a soil that drains very well. Grès Rouges – red sandstone, iron-rich with sand, gravel, pebbles and sea shells from marine sediment. Retains water but at the same time it drains well. Eclats Calcaires – formed from porous limestone. A relatively shallow soil, the roots do not go deep, but obtain water from cracks and fissures in the crumbling rock. Ogier’s wines are impressive overall. The regular cuvées of the Châteauneuf-du-Pape Clos de l’Oratoire are relatively easy to find in independent merchants, but the ‘Expression de Terroir’ series is made in very small quantities. Retailers including Berry Bros & Rudd and Fine + Rare Wines had an allocation of the first vintages, but at time of writing the 2011s tasted here are waiting to be shipped. This link to wine-searcher will identify current stockists. Very fresh, a beautiful little herb and grassy hit that really lifts and cools the aromatics. Tropical notes of melon and ripe Asian pear. Delicious palate, real freshness, that limpid pear and melon fruit, delicious grapefruit and lime bite and good length, not too heavy or alcoholic. Equal parts Grenache Blanc, Clairette, Roussanne and 10% Bourboulenc with an average vine age of 35 years, only the Clairette sees some oak. 90/100. Really bountiful, vanilla-laden, more buttery character than the 2012 one month more in oak for the Clairette). There is a sumptuous element on the palate, though again that freshness is there: a real juicy bite of citrus sharpening the finish, though it is a big, powerful wine with real concentration. 91/100. A blend of 80% Grenache, 8% Syrah, 7% Mourvèdre and 5% Cinsault from vines with an average age of 40 years. The regular Châteauneuf-du-Pape cuvée is a blend of one third each fruit from Galets Roulés, Safres and Eclats Calcaires soils. The blend spends 12 months in old, large barrels. Not so clear aromatically as the 2007 also tasted, but a meatiness and a red fruit and plum freshness. Lovely palate. Lots of juicy, vinous character with red fruits and a fine tannin framework. Good acidity – seems a touch sharper than the 2007, but also very young. Needs time. 91-92/100. The same blend of grapes in 2007, and the same winemaking. This has a much more expressive and lovely raspberry jam and dry, wheaty, nut husk Grenache character. There’s a chocolaty quality developing. A delicious orangey freshness to the acidity too with cherry bite and refined tannins. 93/100. Grenache makes up 65% of the blend along with 35% Syrah, the vines with an average age of 60 years and the wine spends 14 months in 300 and 600 litre barrels, 80% of which are new. Beautiful nutty and raspberry freshness despite the smaller, newer oak, with chocolaty and ripe, almost minty notes, but also that a dry, redcurrant earthiness and a complex touch of game in the perfume. Delicious grip and freshness, the tannins roughening and grippy, but so long and creamy, beautifully balanced and packed with personality. Will mature over many years. 93/100. All of the wines in the Expression de Terroir series are 95% Grenache and 5% other Châteauneuf varieties, the vineyards 40 – 50 years old, and all spend 12 months in large oak barrels. These porous limestone soils are the oldest in the appellation, the vines finding water through many cracks and fissures in the rock. There is little water stress, so grapes normally mature well. This has a lovely nose that is cherry ripe with a definite wheaty note. On the plate a certain creaminess to texture and flavour, making the wine really drinkable, ripe and approachable. The palate continues with that ripeness of fruit and tannins, again the hallmark of this cuvée for me being its freshness and approachability. 90/100. ‘Safres’ is sand, the soils deriving from marine sediment which lacks the stones and pebbles of so many Châteauneuf vineyards and is low in limestone. The soil is deep and fast draining. This has such tight, juicy concentration on the nose with plenty of raspberry and fresh cracked wheat. Certainly more depth and apparent concentration here, a more masculine character, with a big, juicy core to the fruit and a liquoricy cut. Deliciously juicy and concentrated. 93/100. The red sandstone soils are rich in iron, with sand, gravel, seashells and pebbles from marine sediment. The sandstone retains enough water to supply the vines generously, but also drains well. This has a big, closed nose. It is a little touch reductive, but there’s a deliciously plummy sense of weight and power here. Absolutely delicious texture in the mouth, with such pure power and concentration to the tannins and the acidity. 92/100. The classic Châteauneuf vineyards, deeply layered with large, round ‘pudding stones’ that were formed from erosion of the Alps and carried here by glaciers. Roots go very deep through these soils, but the heat absorbed by the stones mean top soils are warm whilst deeper down is much cooler. This is dense and ripe. Very sweet and powerful stuff with a real raspberry creaminess to the fruit and an enveloping sense of richness. It’s a big wine with very sweet tannins and a smooth-textured elegance. Delicious, arguably the most commercial of the series, but I love the spice, power, sweetness and depth. 93/100.